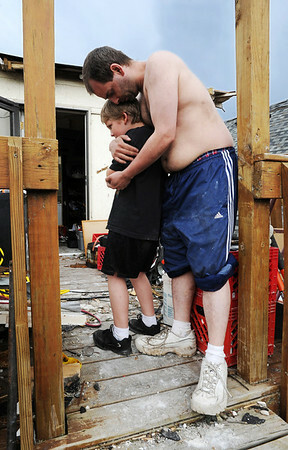 Robert Stewart comforts his 8-year-old son Decosh Stewart, who suffers from autism, as another storm front moves into the area Friday afternoon, May 27, 2011, outside the ruins of their 2105 Pennsylvania Ave. home in Joplin. Stewart's wife said, "We were home when it happened and Decosh was at a neighbor friend's house. We hid in the basement and Robert ran to our son as soon as the storm passed."